So, you decided to get a Windows 8 laptop with a touch screen. Or you upgraded your old compute to Windows 8. It’s worth noting your experience with just a mouse will be somewhat different from using a touch screen. I find the touch screen more intuitive overall, but the mouse does work. While I rarely read the manual for things, I definitely recommend you first step be to read Microsoft’s Getting Started page. There are a lot of tips on how to use the windows, close programs, and how to use the mouse. The best option, if you have a Microsoft Store nearby, is t stop in and let a dales person help. All the people I talked to were excellent, and explained first thing some of the most useful things they have found. Search: On the tile screen, just start typing and your apps will search. You can also press Internet Explorer to search the Web. Switch to last program: Swipe from the left side of the screen. Select from all running programs: Swipe from the left, drag the window back to the left side. Close an app you are using: Slide your finger from the top of the screen to the bottom. Close an app you’re not using: Slide from the left side, pause for a half-second in the middle of the screen, then drag it down. Log in: Swipe right and choose Settings –> Choose PC Settings. Select Users and check out the login options. You can set up a PIN, or a Photo Password. Right now I love the photo password, though you definitely need to get it right. In all cases, when I say slide from the right or top of the screen, I mean put your finger off of the screen, and slide onto it. The Microsoft page has some good detail here. As I blog I find myself writing in one app, swiping from the left to bring up IE and find a link or information, copy it, swipe from the left, going back to Live Writer, and pasting in. It’s a great way to swap between two windows quickly. If you didn’t set up a Microsoft account when you set up Windows 8, you certainly need to wen buying apps in the Microsoft Store. One of the nice things here is that your account gets you 7Gb of storage on SkyDrive, where you can share photos. It will also share some of your settings, including letting you use you Microsoft password on any computer where your account has been set-up. 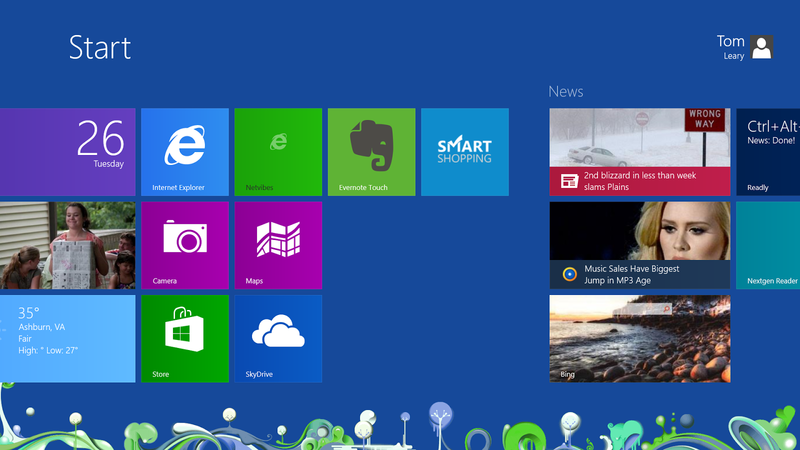 We have two Windows 8 PCs at home now, so I have an account on my wife’s computer, and she has one on mine. She just added my Email to the computer, and now I can use my password on both computers, and get most of my settings. It won’t automatically download and show all my apps, which is a bummer, but at least when I download them in the App store I don’t have to pay again, and it keeps my settings. If you have kids, it’s worth getting them Email accounts. We set one up for each kid, and have begun talking about internet safety. With their Email set up, we were able to add them as child users on each laptop. Again their password and settings are shared. But more importantly, online we can work with Microsoft’s Internet Safety. We can limit what the kids do, how much time they spend in apps, and we get a weekly Email of how much time thy have spent. The only down side to them having their own account is that if you bought an app for yourself, you will have to buy it again for each kid. We’re using this as an opportunity for them to understand how much things cost, and use their own allowance, or as a special gift for being good. Setting this up was incredibly easy. Swipe from right and choose Settings –> Change PC Settings. Select Users and scroll down and select Add User. If the kids don’t have an account, you can just type one in for them, and you’ll get a screen to fill in more information. You will have to get you credit card charged once for 50 cents to confirm you are an adult, but once you do it once you don’t need to for additional kids. After it’s all set up you can change permissions and settings on the Web from any computer at the Family Safety site. Their Internet Safety site is great, and well worth looking over to discuss with your kids. The best built-in, under-appreciated app is Music. It’s like Spotify, where you can plan any song, album, or set up playlists. What Music does better than Spotify is easily show new albums, and they have absolutely anything you could want available the day it goes live. There are a few albums you have to pay for, or wait a few weeks. But you’d have the same problem with Spotify. The user interface with Music is incredible, and very simple to use.